Guru Nanak pronunciation  (Punjabi: Gurmukhi ਗੁਰੂ ਨਾਨਕ, Punjabi: Shahmukhi گرونانک, Hindi: गुरु नानक, Urdu: گرونانک, [ˈɡʊɾu ˈnɑnək] Gurū Nānak) (15 April 1469 – 22 September 1539) was the founder of Sikhism and the first of the ten Sikh Gurus. His birth is celebrated world-wide as Guru Nanak Gurpurab on Kartik Pooranmashi, the full-moon day in the month of Katak, October–November. Guru Nanak has been called "one of the greatest religious innovators of all time". He travelled far and wide teaching people the message of one God who dwells in every one of His creations and constitutes the eternal Truth. He set up a unique spiritual, social, and political platform based on equality, fraternal love, goodness, and virtue. 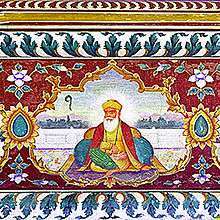 Nanak was born on 15 April 1469 at Rāi Bhoi Kī Talvaṇḍī (present day Nankana Sahib, Punjab, Pakistan) near Lahore. His parents were Kalyan Chand Das Bedi, popularly shortened to Mehta Kalu, and Mata Tripta. His father was the local patwari (accountant) for crop revenue in the village of Talwandi. His parents were both Hindus and belonged to the merchant caste. He had one sister, Bebe Nanaki, who was five years older than he was. In 1475 she married and moved to Sultanpur. 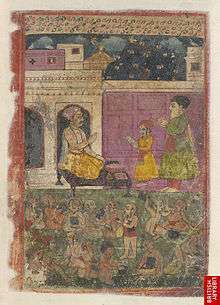 Nanak was attached to his sister and followed her to Sultanpur to live with her and her husband, Jai Ram. At the age of around 16 years, Nanak started working under Daulat Khan Lodi, employer of Nanaki's husband. This was a formative time for Nanak, as the Puratan (traditional) Janam Sakhi suggests, and in his numerous allusions to governmental structure in his hymns, most likely gained at this time. Gyan-ratanavali is attributed to Bhai Mani Singh who wrote it with the express intention of correcting heretical accounts of Guru Nanak. Bhai Mani Singh was a Sikh of Guru Gobind Singh who was approached by some Sikhs with a request that he should prepare an authentic account of Guru Nanak’s life. Bhai Mani Singh writes : Just as swimmers fix reeds in the river so that those who do not know the way may also cross, so I shall take Bhai Gurdas’s var as my basis and in accordance with it, and with the accounts that I have heard at the court of the tenth Master, I shall relate to you whatever commentary issues from my humble mind. At the end of the Janam-sakhi there is an epilogue in which it is stated that the completed work was taken to Guru Gobind Singh for his seal of approval. Guru Sahib duly signed it and commended it as a means of acquiring knowledge of Sikh belief. Rai Bular, the local landlord and Nanak's sister Bibi Nanaki were the first people who recognised divine qualities in the boy. They encouraged and supported him to study and travel. Sikh tradition states that at around 1499, at the age of 30, he had a vision. After he failed to return from his ablutions, his clothes were found on the bank of a local stream called the Kali Bein. The townspeople assumed he had drowned in the river; Daulat Khan had the river dragged, but no body was found. Three days after disappearing, Nanak reappeared, staying silent. "There is neither Hindu nor Mussulman (Muslim), but only man. So whose path shall I follow? I shall follow God's path. God is neither Hindu nor Mussulman and the path which I follow is God's." "This is the cup of the adoration of God's name. Drink it. I am with you. I bless you and raise you up. Whoever remembers you will enjoy my favour. Go, rejoice of my name and teach others to do so. I have bestowed the gift of my name upon you. Let this be your calling." From this point onwards, Nanak is described in accounts as a Guru (teacher), and Sikhism was born. The main basic belief of Sikhism is to spread the message of kindness, and peace, instead of revenge and spite. Sikhism is one of the most recently formed religions in the world. Sikhs follow the teaching of the Guru Granth Sahib, the holy book which comprises the teaching of six of the ten gurus of Sikhism and some saints and men of devotion. The Guru Granth Sahib is worshipped as the Supreme Authority of Sikhism and is considered the eleventh and final guru of Sikhism. As the first guru of Sikhism, Guru Nanak contributed a total of 974 hymns to the book. Guru Nanak travelled extensively during his lifetime. Some modern accounts state that he visited Tibet, most of South Asia and Arabia starting in 1496, at age 27, when he left his family for a thirty-year period. These claims include Guru Nanak visiting the Mount Sumeru of Indian mythology, as well as Mecca, Baghdad, Achal Batala and Multan, in places he debated religious ideas with competing groups. These stories became widely popular in the 19th and 20th century, and exist in many versions. Nanak appointed Bhai Lehna as the successor Guru, renaming him as Guru Angad, meaning "one’s very own" or "part of you". Shortly after proclaiming Bhai Lehna as his successor, Guru Nanak died on 22 September 1539 in Kartarpur, at the age of 70. 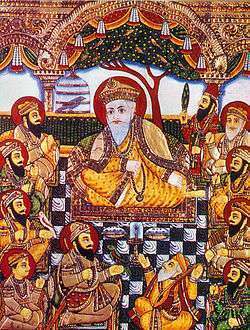 1 2 3 4 "Guru Nanak: A brief overview of the life of Guru Nanak, the founder of the Sikh religion.". ↑ "Sikhism's Origins: The Life of Guru Nanak". religionfacts.com. Retrieved 24 December 2014. 1 2 Cole, W. Owen; Sambhi, Piara Singh (1978). The Sikhs: Their Religious Beliefs and Practices. London: Routledge & Kegan Paul. p. 9. ISBN 0-7100-8842-6. ↑ "Early Gursikhs: Bhai Bala Ji | Gateway to Sikhism". Allaboutsikhs.com. Retrieved 2 May 2010. ↑ Taran Singh. "Sri Guru Granth Sahib". Encyclopaedia of Sikhism. Punjabi University Punjabi. Retrieved 26 September 2015. 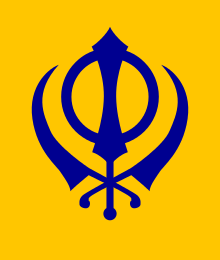 ↑ "Sikhism Religion of the Sikh People". www.sikhs.org. Retrieved 2015-09-26. ↑ Singh, Harjeet (2009). Faith & Philosophy of Sikhism. Kalpaz. p. 85. ISBN 9788178357218. ↑ Sikhism, Encyclopedia Britannica (2014), Quote: "In its earliest stage Sikhism was clearly a movement within the Hindu tradition; Nanak was raised a Hindu and eventually belonged to the Sant tradition of northern India,"